Colds and allergies are distinctly different disorders, but can produce similar symptoms, including sneezing, sinus congestion, runny nose, scratchy throat and sinus headache. The common cold targets the upper respiratory tract and is the result of exposure to one of more than 200 different cold viruses. Allergies are the result of your immune system reacting abnormally to otherwise harmless substances. Herbal teas, made from a variety of herbs, may offer some relief for mild cold or allergy symptoms. See your doctor if your symptoms persist, and ask your doctor if herbal teas are safe for you. When you inhale, ingest or encounter a substance to which you are allergic, your body’s reaction is to produce histamine, which triggers irritation, swelling, increased mucus production and dilation of blood vessels. Herbal teas that contain natural antihistamines may reduce mild allergy symptoms. The “Gale Encyclopedia of Alternative Medicine” lists stinging nettle, licorice root, Chinese skullcap, gingko, echinacea and cramp bark as potentially beneficial teas for treating allergies. Follow the instructions on the package for making herbal tea and do not drink more than the maximum suggested amount. The “Gale Encyclopedia” suggests a general method for making herbal tea — pouring 1 cup of boiling water over 1 to 2 tsp. of herb and steeping for five to 10 minutes before straining. 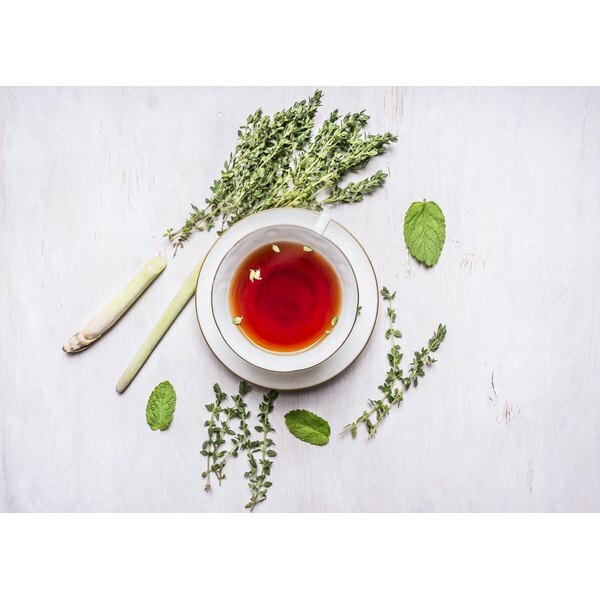 Each herb has its own properties and potentially toxic levels, however, so talk to your doctor before treating a cold or allergy with any herbal tea. The Food and Drug Administration, FDA, does not regulate the production of herbal teas; thus, you have no guarantee that any tea is free from pesticides or other contaminants. While medicinal herbs may be helpful in reducing some allergy or cold symptoms, they may also cause side effects. Herbal remedies cannot replace professional medical advice, so use herbal teas under your doctor’s supervision.